This article is about the starship weapon. For other uses of the term "plasma turret" and the UNSC operation, see Plasma cannon and Operation: TORPEDO. "Just another item in the Covenant's bottomless arsenal. Not a plasma torpedo, or we'd already be free-floating molecules." Plasma torpedoes are a type of plasma weapon used by most Covenant capital ships. Along with the pulse laser turret, plasma cannon and energy projector, they are one of the Covenant's primary ship-to-ship weapons. Fired by "silos" located along a ship's hull, plasma torpedoes can strike at exceedingly long ranges. Upon contact, a plasma torpedo causes severe damage to the target, boiling armor or overloading shields. The weapon can be used in conjunction with pulse laser turrets and energy projectors to destroy entire UNSC fleets. The systems used to fire plasma torpedoes are known as plasma torpedo silos or plasma turrets, which are located along the hull of the ship. At least on some Covenant vessels, the turret or "silo" is antenna-like in appearance and is installed on universal joints often located along the lateral sides of the ship. The torpedoes are typically described as red or purple in color and short, with a ball-like head and a trail. The torpedoes themselves are initially stored aboard Covenant vessels as inert cores, which are roughly cylindrical objects that range between 3-5 meters in total length. For Ket-pattern CCS-class battlecruisers such as the Truth and Reconciliation and probably other ships that are armed with plasma torpedo silos, thousands of these inert cores are carefully packaged and stored in munitions racks before each deployment of the vessel. "The Covenant cruiser came about to face them. Its plasma turrets glowed like angry red eyes." The frigates Arabia and Vostok being severed instantly by plasma torpedoes. The inert plasma torpedo cores are ignited in a pinched magnetic field by energy supplied from the ship's pinch fusion reactors and guided by magnetic coils. When the weapon charges, a line of superheated plasma forms alongside the exterior plasma conduit adjoining the turret. Once fully charged, the now ignited plasma torpedo core fires outward at its target. The torpedo is guided towards its target by a long-reaching magnetic field projected by the emitter. Upon impact, the torpedo penetrates most unshielded starships, burning through internal decks and structures, thus causing heavy damage on the target. They are extraordinarily accurate; one of the only ways for UNSC ships to even temporarily avoid them is to use emergency thrusters to "dodge" incoming plasma torpedoes at the last moment. Particularly strong magnetospheres, such as those of gas giants, will disrupt the magnetic field guiding the torpedo, dissipating the plasma and rendering the torpedo harmless. The dust and vapor from missiles detonated close enough to the ship may also absorb the energy from a torpedo, rendering it harmless. When the damaged Ascendant Justice entered the atmosphere of Threshold, the massive wake of superheated gases trailing the ship scattered the plasma torpedoes fired by pursuing Covenant vessels. The attacking ship must lower a section of its shield in order to fire the torpedo, otherwise it would detonate inside the protective barrier. John-117 used this weakness to temporarily blind a Covenant cruiser with a Longsword and to penetrate the shields of the Ascendant Justice. Plasma torpedoes can be manually guided from a weapons control station on the bridge, by using holographic "steering spheres" superimposed over a holographic display of the space surrounding the ship. The plasma torpedoes and steering solutions of an enemy ship are similarly shown on the display. The Covenant have also developed "counter guiding signals", a form of electronic countermeasure that disrupts the guidance control of an enemy ship's plasma torpedoes. If the firing ship is destroyed, all plasma torpedoes guided by its magnetic fields are either detonated prematurely or fly about aimlessly. However, it appears that torpedoes are sometimes able to hold together for a small amount of time, as demonstrated during the Fall of Reach, when fired torpedoes destroyed UNSC orbital defense platforms even after their firers had been destroyed. Volleys of plasma torpedoes are frequently the first attacks launched by Covenant fleets when engaging enemy forces at long range. They often decimate enemy ranks upon impact. They emit visible radiation, giving them an amber color but volleys are visually akin to solar flares due to the sheer number of torpedoes launched. It has been said a single volley can destroy a ship from bow to stern. Occasionally, plasma torpedoes can miss their target and fail to reacquire them if the target is moving towards the launcher at an oblique angle and high speed, such as the offensive maneuver conducted by John-117 to evade the fire of the Covenant ships at Alpha Halo during the Skirmish over Threshold, or also if the movement of the craft is erratic such as the way Keyes evaded the torpedoes during the Keyes Loop by detonating the ship's emergency thrusters seconds before impact. Even though they are considered very accurate against capital ships and space stations, they can frequently be evaded by smaller craft, such as Pelican dropships and Longswords. As with many other examples of their technology, the Covenant themselves only understand a fraction of the underlying science involved with the operation of the plasma turret. As a result, despite their overwhelming power against human ships, the Covenant's methods of using their weapons systems are highly inefficient, relying on crude brute-force calculations and causing wasteful energy expenditure due to their slow operation; this is also why the turrets glow before firing. When in control of the Covenant ship Ascendant Justice, UNSC AI Cortana was able to use the vessel's plasma turrets to their full potential; she created an entirely new system to control the plasma, using electromagnetic pulses to direct the plasma into precision beams within a microsecond. This enabled her to use the weapons with far greater power and precision than the Covenant themselves, cutting through Covenant vessels like a scalpel, not unlike an energy projector. According to Cortana, she could have improved the plasma turrets even further had the Covenant ship possessed better electromagnetic systems. The magnetic coils used in a MAC gun can be used to shape and guide the plasma fired by a plasma turret; this was seen before the Massacre at Eridanus Secundus, when the UNSC Gettysburg's magnetic coils were used to guide plasma torpedoes fired by the Ascendant Justice's turrets. Jaet-pattern - CPV-class heavy destroyers are armed with six of these silos, while DSC-class support ships are armed with eight. Litrex-pattern - Hekar Taa-pattern Blockade Runners are armed with 16 of this type of silo. Qur-pattern plasma torpedo silos - ORS-class heavy cruisers are armed with 16 of this type of silo. Serpens-pattern - The Truth and Reconciliation is armed with 16 of these silos, while other CCS-class battlecruisers may be armed with them as well. Sintra-pattern - CRS-class light cruisers are armed with six of these silos. The specific type of torpedo employed by these silos is described as extremely swift in flight but almost impossible to control. They are considered to be best employed in a bombardment role rather than normal ship to ship combat. Mictix-pattern - The Shadow of Intent is armed with 24 of this type of heavy silo, while other CAS-class assault carriers could also be armed with this type of weapon. There is a notable inconsistency in the way plasma torpedoes are described in Eric Nylund's novels (particularly Halo: First Strike and Halo: Ghosts of Onyx) and later media, namely Halo: Mortal Dictata and Halo: Warfleet. According to the earlier novels, plasma torpedoes were simply created from an amorphous supply of plasma, rather than being physical projectiles, and several plot points and scenes are constructed around this fact. Halo: Mortal Dictata was the first media to refer to the plasma torpedoes of the battlecruiser Pious Inquisitor as physical objects stored aboard the vessel in a dedicated "torpedo bay". Halo: Warfleet confirmed that there is a tangible component to the munitions, in the form of inert plasma torpedo cores carried aboard Covenant starships. According to 343 Industries, the notion of plasma torpedoes being physical projectiles originates from their Halo Story Bible, though no explanation has been offered to reconcile the discrepancy to the depictions in the early novels. 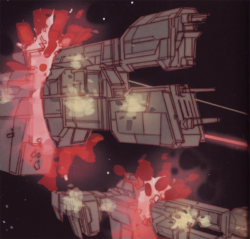 While the term "plasma torpedo" is used throughout the novels, the weapons used to fire the torpedoes are only identified as "plasma turrets" in Halo: First Strike, which also describes their operational mechanisms in detail. Halo Waypoint's article for the Song of Retribution introduces a distinction between the assault carrier's "Anterior Plasma Cannons" and "Plasma Torpedo Silo Network", listing these weapon systems as the ship's secondary and tertiary armament, respectively. This is a change from the novels, which (with some exceptions) mainly describe the Covenant using three layers of starship weaponry: energy projectors, plasma torpedoes and pulse lasers. The term "plasma cannon" is also used in reference to Covenant warships' secondary armament throughout Halo: The Essential Visual Guide, and in Halo: Contact Harvest, a "heavy plasma cannon" (most often referred to only as a "plasma cannon") is mentioned as the Rapid Conversion's main weapon system. In the Halo Legends episode The Package, what appear to be plasma torpedoes (although smaller and more numerous than typically described in the novels) are referred to as "plasma rounds". However, it should be acknowledged that the terms "cannon" and "turret" are rather general and are likely used descriptively rather than being restricted to specific weapon systems. From the context in Contact Harvest, for example, it is apparent that the Rapid Conversion's "plasma cannon" is in fact referring to the ship's energy projector. Therefore it can be assumed there is a substantial amount of overlap between the terms. Halo: Combat Evolved, Halo 3 and Halo: Reach depict Covenant starships firing blue or blue-purple bolts of plasma which are seemingly unguided. Meanwhile, the novels consistently describe plasma torpedoes as being red as well as highly maneuverable. Given these differences, it is likely that the plasma weapons depicted in the games are in fact representative of the "plasma cannons" listed in the Song of Retribution's arsenal rather than plasma torpedoes. Halo: Combat Evolved depicts the UNSC Pillar of Autumn being struck by numerous blue plasma bolts. In Halo: The Flood, Captain Keyes remarks that the Covenant cannot be targeting the Autumn with plasma torpedoes, or else the ship would have been reduced into "free-floating molecules"; thus, the plasma weapons in question must be some other form of starship plasma weapon. Halo Waypoint's article for Covenant corvettes corroborates this distinction, listing "plasma cannons" as the corvettes' sole weapon system. The distinction between "plasma cannons" and "plasma torpedoes" is carried over to Halo: Fleet Battles, where many classes of Covenant ships are listed as being armed with both types of weapon systems. Halo: Warfleet establishes that many types of Covenant starships such as CCS-class battlecruisers, ORS-class heavy cruisers, and CPV-class heavy destroyers are armed with both plasma torpedo silos and plasma cannons. These plasma torpedo silos can only be assumed to be the "plasma turrets" that are described in Halo: First Strike, while the separate plasma cannon weapon systems seem to explain the multiple instances in-game of Covenant starships firing unguided blue bolts of plasma. In light of these deductions, and for the purposes of categorization, this wiki assumes that the blue, unguided bolts of plasma are plasma cannon projectiles, while the red or purple and guided plasma bolts are plasma torpedoes. A Covenant super-destroyer firing plasma torpedoes in Halo Wars: Genesis. A CCS-class battlecruiser firing "plasma rounds" and pulse lasers in Halo Legends: The Package.